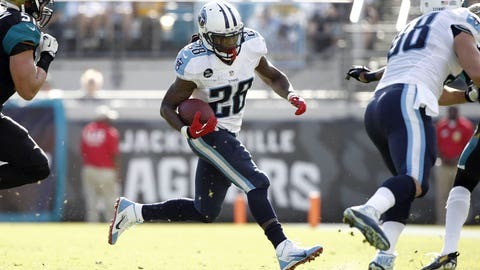 Titans tailback Chris Johnson, who's still in the running for his sixth straight season of 1,400-plus total yards, accounted for 93 total yards against the Jaguars. JACKSONVILLE, Fla. — Nate Washington spoiled Brad Meester’s home finale. He also may have helped save Mike Munchak’s job. Washington scored on a 30-yard reception in the fourth quarter and Tennessee got a much-needed defensive stop late — both equally huge in helping the Titans beat the Jacksonville Jaguars 20-16 and end a three-game losing streak Sunday. Munchak surely didn’t need getting swept by Jacksonville on his resume. And with lowly Houston up next, the Titans (6-9) could make a case for keeping their longtime player and coach another year. Tennessee overcame a 10-point deficit in the second half and won for just the third time since September. Washington made several key plays, none bigger than when he slipped behind Alan Ball and caught Ryan Fitzpatrick’s pass early in the fourth period for the go-ahead score. He finished with six catches for 117 yards. The Jaguars (4-11) were in position to take the lead after that, but Ropati Pitoitua stuffed Maurice Jones-Drew on a fourth-and-1 play at the Tennessee 20 with 5:21 remaining. It was the seventh fourth-down attempt in a fairly entertaining game, one of three on this weekend’s NFL schedule with no playoff implications. The highlight came when Jacksonville honored the retiring Meester with a reception — the pass-catching kind. The Jaguars called a screen play for the 14-year veteran center who announced Wednesday that Sunday’s game would be his home finale. Meester spent his entire career in Jacksonville, and the team recognized him before the game by only announcing him in pregame introductions. It was a nice tough. The Jaguars also honored him after the game, presenting him with four framed jerseys. But offensive coordinator Jedd Fisch didn’t wait for the postgame celebration. He dialed up a play for Meester in the first quarter. Meester reported as an eligible receiver, lined up at tight end and then caught the screen pass. Meester had fellow offensive linemen Uche Nwaneri and Austin Pasztor out front and plenty of open space. But Meester ran into Nwaneri’s back — maybe expected for someone making his first career catch. Still, the play gained 9 yards and set up Chad Henne’s 4-yard touchdown pass to Marcedes Lewis. The Jaguars were up 13-6 after Henne hooked up with Mike Brown late in the first half, but Josh Scobee’s extra point was blocked. That proved big, especially when Jacksonville was in field-goal range late but had to go for it on fourth down. Jones-Drew finished with 45 yards, becoming the 46th player in NFL history with 8,000 yards rushing. Henne completed 24 of 34 passes for 237 yards, with two touchdowns and an interception. Fitzpatrick was 17-of-26 passing for 181 yards, with a touchdown and an interception for Tennessee. Shonn Greene ran for 91 yards and a score, and Chris Johnson finished with 90 yards on the ground. Losing to Jacksonville could have been the final blow for Munchak, whose team had dropped eight of 10 heading in Sunday. The Texans fired Gary Kubiak after getting swept by the Jaguars. And Jacksonville was about as banged up as any team late in the season. The Jags played without several starters and lost a few more — defensive tackle Brandon Deaderick, linebacker John Thomas and cornerback Dwayne Gratz — in the game.